Made in Canada since 1955...The Columbia Fixed Curb MountLoE3 Triple Glazed Clear glass skylight with BLACK outer frame is ideal aesthetically for black or grey roofing applications. It is the ONLY skylight ENERGY STAR certified in all 3 of Canada's Climatic zones. Ideal for the Prairies, Northern Ontario and Quebec and the Maritimes. Combines 3 glazing layers and 2 LoE3 coatings to create the most Energy efficient option. The Fixed Curb Mount skylight is the preferred skylight mount for any type of roof, primarily for use on tile, shingle or wood shake roofs. Recommended by roofing professionals as the optimum choice for long lasting, trouble free installation. Designed to withstand Canada's harshest climates. Curb Mount Glass skylights REQUIRE MINIMUM 2:12 roof pitch. Provides 48% visible light transmission with the best performance against heat gain and heat loss. Requires aluminum flashing kit. Model FKCM-BLK available online or in store. Use of Columbia's Roofing Underlayment highly recommended to ensure optimal weather tight seal. Available online. ENERGY STAR Certified in ALL 3 zones in Canada. A premium deck mounted skylight that provides a natural finish. Includes a Canadian Douglas Fir curb, PVC base frame and extruded aluminum cap. IMPORTANT: Must be installed using Columbia's Deck Mount flashing kit or warranty is void. Available online (Model FKRW S06). 2 ft. x 2 ft. 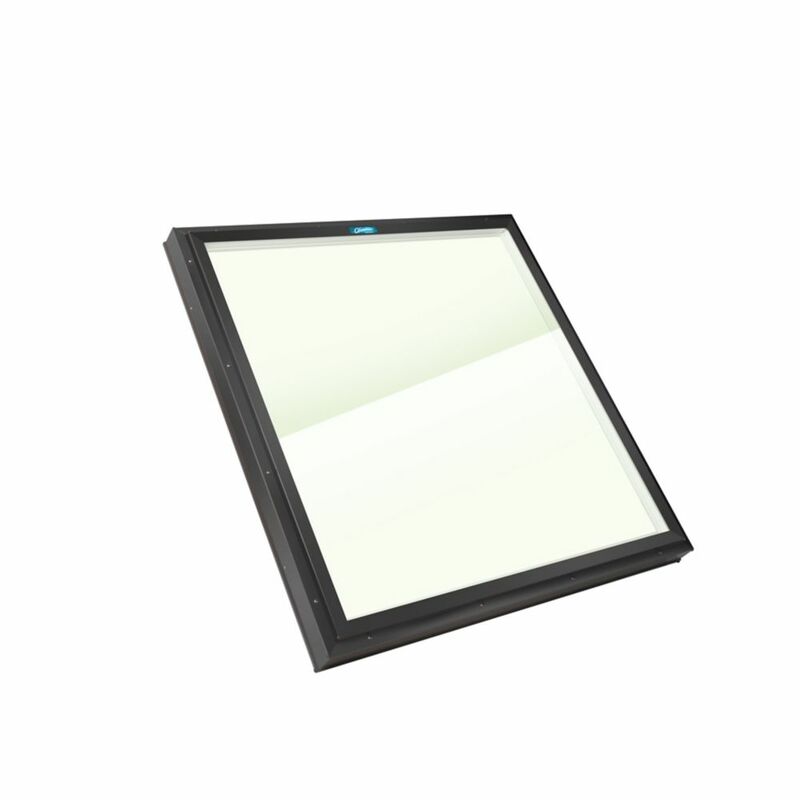 Fixed Curb Mount Triple Glazed Glass Skylight with Black Cap - ENERGY STAR® Made in Canada since 1955...The Columbia Fixed Curb MountLoE3 Triple Glazed Clear glass skylight with BLACK outer frame is ideal aesthetically for black or grey roofing applications. It is the ONLY skylight ENERGY STAR certified in all 3 of Canada's Climatic zones. Ideal for the Prairies, Northern Ontario and Quebec and the Maritimes. Combines 3 glazing layers and 2 LoE3 coatings to create the most Energy efficient option. The Fixed Curb Mount skylight is the preferred skylight mount for any type of roof, primarily for use on tile, shingle or wood shake roofs. Recommended by roofing professionals as the optimum choice for long lasting, trouble free installation. Designed to withstand Canada's harshest climates. Curb Mount Glass skylights REQUIRE MINIMUM 2:12 roof pitch. 2 ft. x 2 ft. Fixed Curb Mount Triple Glazed Glass Skylight with Black Cap - ENERGY STAR® is rated 5.0 out of 5 by 1. Rated 5 out of 5 by Kimberley007 from Nice-looking, quality-made skylight We replaced our old domed, leaky, plastic skylight with this new one. It looks great and made the room much warmer ( in cool weather). I wasn't expecting glass to be tinted but will be a help in the scorching summer afternoon sun. Love that this product is made in Canada. I would recommend it. We bought the flashing kit that goes along with this model. Was easy to install however I disagree with instructions to start flashing at the top...everything I know and have read says to start at bottom and work your way up. That's how we installed it and no leaks!